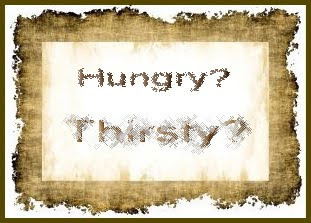 Did you ever feel hungry or thirsty? Fainting? Tired? Need recharging? What did you do? More than likely, you nurtured yourself with food, water, rest, and whatever else your body needed. Just as it is possible to get weary physically, it is equally possible to get weary spiritually. God “gives food to the hungry” (Ps. 146:7 NKJV) and “turns deserts into pools of water, the dry land into springs of water. He brings the hungry to settle there.” (Ps. 107:35-36 NLT) But the Lord’s offering of refreshing, spiritual bread and water, is not from without, but from within. When you become tired from your journey and your weary soul shrivels up, feeling bone-dry, what do you do? When every last drop of spiritual vitality has evaporated, where do you go to fill that lack? Do you reach outside to the world to replenish yourself? Or do you seek solace within to refresh yourself with the Bread of Life and the Living Waters? When you reach within to draw from the Lord, just as Elijah, He will lead you to drink of the Brook Cherith and command His wings servants to feed you. And when you hunger and thirst after the things of God, you will be filled. That is God’s promise to you! Thanks for your wise words here based on that Scripture verse. Amen and amen! Praise God for feeding us. I read an excellent book on the beatitudes (A Beautiful Offering by Angela Thomas) that opened my eyes to these amazing blessings. She talked about how the beatitudes aren’t “gotta-bes” (in other words, we don’t gotta be hungry, thirsty, etc. ), but rather blessings for when we inevitably find ourselves in those predicaments. Thanks for sharing, Lynn, as always! Thanks so much for stopping by and commenting, Terra! So glad to see you! Blessings to you! Oh, wow, Katie! Even though that’s the way I’ve written these, the light bulb went on! Thanks so much for your comment and I’ll have to check out the book! Be blessed, sweetie! Lynn, I’ve just been catching up on reading your Beatitude posts. It’s been hard to find time with travels and being with family, but your writing does nourish my soul! Thank you for sharing the blessing.